A loan of $2,000 helped to buy solar cells for his house. Ahmed, who appears in the photo, is a 28-year-old man from Jabalia, Gaza Strip. He is a single man, who lives with his family in a small house. He tries so hard to make his family live in the best conditions. Ahmed earns a low income that is barely enough for the basic needs of his family. Power outages and restrictions on electricity are common in the blockaded Gaza Strip, which affect the daily lives of people living there. 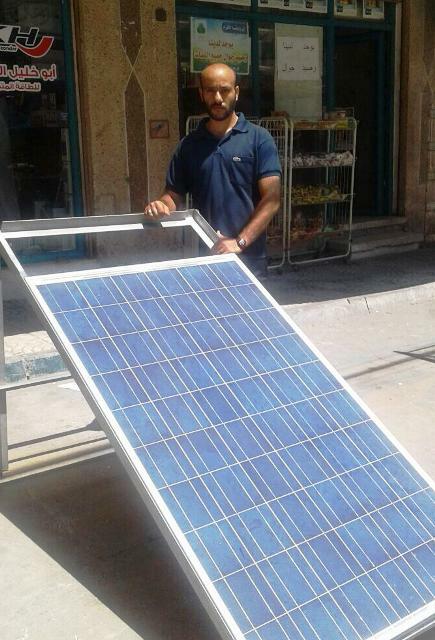 To solve the problem of the power outage, Ahmed went to Palestine for Credit and Development (FATEN) to request a US Dollar loan to buy solar cells for his house. He hopes you will help and fund his loan. It provides access to environmentally friendly products. This loan is part of FATEN's green loan program, which helps clients gain access to environmentally friendly products that reduce pollution in Palestine. The loan will specifically be used to purchase solar panels, usually used to heat water, or electric generators which store solar energy. In addition to being environmentally friendly, Palestine suffers from high electricity prices and power outages are a common occurrence, especially in the Gaza Strip. By supporting this environmentally friendly loan product, you are helping people in Palestine reduce their utility costs and providing them with a more reliable source of electricity. Palestinians face unique challenges due to the economic and political environment in the West Bank and Gaza. Click here to learn more about how Kiva and FATEN are working to help Palestinian borrowers overcome these obstacles and how your support can make a difference. Kiva has an important role to play in volatile environments like Palestine. Kiva’s flexible, risk-tolerant funding offers FATEN the opportunity to strengthen its operations and focus on breaking-even while grappling with tough conditions. Like Kiva, FATEN is committed to improving the welfare of low-income entrepreneurs, and helping them overcome hardships outside of their control.